I’d like to start this week by sharing the concept of The Resource Pyramid. This simple concept helps us to understand what we need to do to develop a ministry to the next level. I originally shared this concept in a message in a joint worship service in June 2006. You can listen to the message and view the notes on the church web site. What is the Resource Pyramid? Ultimately every church has as its mission the Great Commission. We are called to impact the world for Jesus Christ. 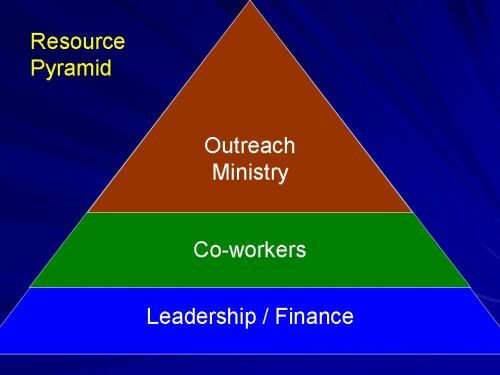 Our outreach ministry is represented by the top layer in the pyramid at the left (click on the picture to see a larger image). But to make that ministry possible we need a team of co-workers to support it, represented by the second layer in the diagram. Finally, to recruit, train, and care for the co-workers we need a leadership team, represented by the bottom layer. When I arrived at CFC in 1994, I immediately set out to build up the college fellowship and to begin to reach out to young adults. For the first couple of years there were a few complaints that I wasn’t giving enough attention to the youth, but gradually we were able to establish a solid core of dedicated young adult youth counselors. Up until our current Assistant English Pastor joined our staff in 2004, the Youth Ministry was run by a team of counselors and a volunteer youth ministry director. After a while we began to receive comments from the guest youth speakers at our retreats that our youth counselors were awesome. Several full-time youth pastors from larger churches said that they wished that they had counselors like ours, and I had the impression that they weren’t just being polite. If any of our youth counselors are reading this, let me just say that you guys rock! The Resource Pyramid is simply an application of the ministry principles of Jesus and Paul. Jesus concentrated His efforts on training twelve men in order to prepare them to carry on His work once He was gone. Paul clearly understood that raising up new leaders is the key to maintaining or growing a ministry (2 Tim. 2:2). This concept is so simple that I am almost embarrassed to share it with you, much less make a video. But I have seen many Christian leaders neglect this principle and burn out trying to do all the front line ministry themselves. That’s not what Jesus did, and it’s not what we should do either. What does this mean for the Chinese church? It means that the #1 job of a pastor is raising up leaders. They best way to have an awesome youth ministry is to care for and disciple the college students and young adults. If the EM neglects this, it will always lack the co-workers needed to care for the youth and children. Often Chinese churches have trouble attracting and retaining ABC young adults, but that will be the topic for another article. My predecessor resigned after 8 years of ministry. His reason was he raised up two generation of leaders, only to see them snapped up by the system, diverted from outreach to inward-focused stuff (“church” events), or to see them try to propose new ways of reaching out and be shut down by senior leadership. The young career fellowship, under his leadership was 50 people out of a church of 500. Almost all have left for different churches or dropped out of church entirely. I know this goes back to vision, so I’m not criticizing the resource pyramid. With the right vision, this simple systematic way of adding to ministries keeps everything sustainable. You raise a good point. 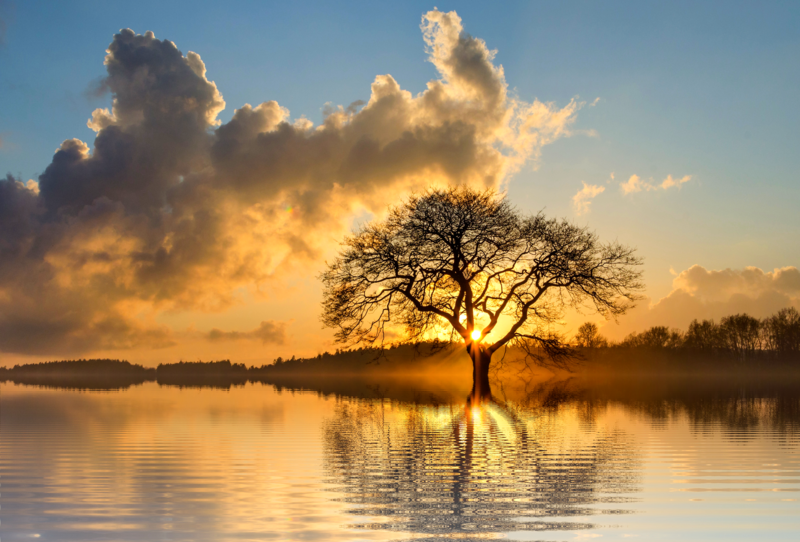 In addition to raising up new leadership, the EM leaders need to have the authority to direct the EM, appoint leaders to different ministries, and set ministry priorities. In most churches it is often the case that several different ministries attempt to recruit the same co-workers. In one way this is good, but it raises the question of how much the senior congregational leadership should guide leaders toward different ministries. Should it be a free for all for “recruiters” from different ministry departments, or should there be a degree of central control? I appreciate your emphasis on raising up leaders. We are indeed called to “make disciples” and they need to serve as an overflow of their lives. Raising up leaders is central and is supported by shepherding, teaching, and modeling being a follower of Christ. By way of recruiting, I like the Networking system that was developed at Willow Creek Community Church where each of the ministries of the church has a job description. The new members go through membership classes. Within the class there are assessments of spiritual gifts and talents. At the end a “neutral” coach can talk w/ individuals about service. Much has to do with the person’s passion, giftedness and “available” time. This seems to have most applicability in a larger church but aspects can be adapted to other churches. Upcoming leaders need to serve in their areas of giftedness w/ the strength that the Lord provides. They do need to be equipped, supported, encouraged, and enriched in their ministries. I have found that many Chinese churches do not have a good understanding of spiritual gifts. One of the first things I did when I came to CFC was to ask a few of the co-workers to switch to different positions, because they were obviously not serving in areas that matched their gifts. We cannot do what Willow Creek does, but we have had a number of spiritual gifts workshops and a few ministry fairs in which we set out job descriptions for a wide variety of ministry positions.